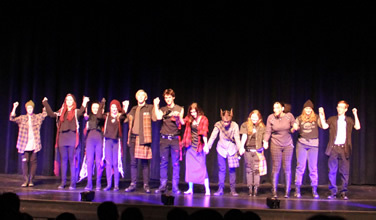 Performing Shakespeare's Macbeth in an abbreviated 45-minute version, a group of Bullis students encountered no bad luck with The Scottish Play—instead, they triumphed. 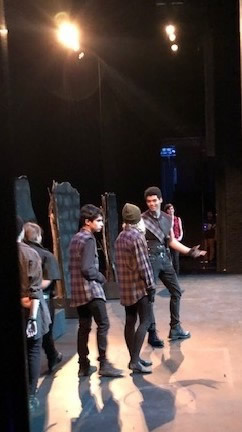 Our Bullis players, including the cast and crew of Macbeth and several other performers, had a great experience onstage, backstage, and in workshops during an exciting weekend at the recent Maryland Thespian Festival held at Towson University. Together with Bullis performing arts faculty Marcia Franklin, Charles Johnson, Anthony Brooks, and Chelsie Lloyd, 32 Bullis students enjoyed a unique chance to immerse themselves in all aspects of the theatrical arts at the annual Maryland State Thespian Festival. Bullis School participates in this festival each year, and the 2019 festival brought together 38 Maryland schools for a weekend of acknowledging and highlighting student achievement in theatre arts through performances, workshops, competitions, awards, and auditions. Bullis students learned from masters and developed their craft while supporting and applauding the efforts of other school participants, as hundreds of students attend the festival each year. Maryland State Thespians, dedicated to supporting public and private middle and high school theatre programs throughout the state and affiliated with the Educational Theatre Association and International Thespian Society, sponsors the annual Maryland State Thespian Festival. A wide variety of workshops and a full range of individual event competitions and even a few auditions for possible college scholarships created a very busy and exhilarating weekend for all. Bullis students worked long and hard to prepare for the festival under the guidance of Upper School Theatre Teacher Marcia Franklin, Middle School Theatre Teacher Chelsie Lloyd, Theatre Tech Teacher Anthony Brooks, and Choral Music Director Charles Johnson. They presented designs in sound and set, and performed monologues, musical theatre duets and solos, short scenes, and the abbreviated Macbeth. They attended workshops from mask making, stage combat, wigs, directing, and improv, to storytelling and vulnerability in acting. They were also treated to a behind-the-scenes peek at the university's extensive theatrical costume collection. Seventeen students prepared for individual events. A sampling of their projects included set designs by Parker Birchard '19 (The 39 Steps), Jacob Sanders '21 (It's Only A Play); and Brock Priddy '21 (Dial M for Murder). Raphael Conrad '19 designed the set for Mamma Mia! (this year's Upper School musical), and qualified for the International Thespian Society's National Conference, one of the high honors at the festival. 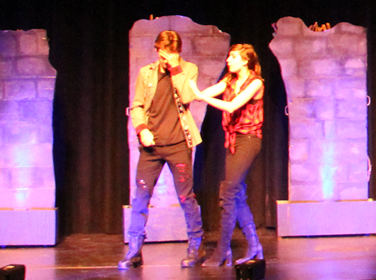 The Bullis production of Macbeth was very well received, earning "Best Actor" medals for Louis Akins '19 and Rachel Sita '20, as well as Outstanding Costumes, Outstanding Technical Crew, and Outstanding Sound Design. Five Bullis students were contacted by colleges and had the opportunity to speak with them regarding theatrical programs. "Overall, it was a very educational and fun weekend," said Marcia Franklin. "I always enjoy attending this festival with our students. I have the opportunity to learn more about them and their interests outside of the classroom, and they have the opportunity to explore and try so many different aspects of the theatre arts. It's an immersive experience unlike any other."